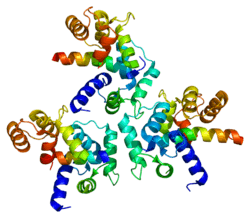 Calcium channel, voltage-dependent, L type, alpha 1C subunit (also known as Cav1.2) is a protein that in humans is encoded by the CACNA1C gene. Cav1.2 is a subunit of L-type voltage-dependent calcium channel. This gene encodes an alpha-1 subunit of a voltage-dependent calcium channel. Calcium channels mediate the influx of calcium ions into the cell upon membrane polarization. The alpha-1 subunit consists of 24 transmembrane segments and forms the pore through which ions pass into the cell. The calcium channel consists of a complex of alpha-1, alpha-2/delta and beta subunits in a 1:1:1 ratio. The S3-S4 linkers of Cav1.2 determine the gating phenotype and modulated gating kinetics of the channel. Cav1.2 is widely expressed in the smooth muscle, pancreatic cells, fibroblasts, and neurons. However, it is particularly important and well known for its expression in the heart where it mediates L-type currents, which causes calcium-induced calcium release from the ER Stores via ryanodine receptors. It depolarizes at -30mV and helps define the shape of the action potential in cardiac and smooth muscle. The protein encoded by this gene binds to and is inhibited by dihydropyridine. In the arteries of the brain, high levels of calcium in mitochondria elevates activity of nuclear factor kappa B NF-κB and transcription of CACNA1c and functional Cav1.2 expression increases. Cav1.2 also regulates levels of osteoprotegerin. CaV1.2 is inhibited by the action of STIM1. The activity of CaV1.2 channels is tightly regulated by the Ca2+ signals they produce. An increase in intracellular Ca2+ concentration implicated in Cav1.2 facilitation, a form of positive feedback called Ca2+-dependent facilitation, that amplifies Ca2+ influx. In addition, increasing influx intracellular Ca2+ concentration has implicated to exert the opposite effect Ca2+ dependent inactivation. These activation and inactivation mechanisms both involve Ca2+ binding to calmodulin (CaM) in the IQ domain in the C-terminal tail of these channels. Cav1.2 channels are arranged in cluster of eight, on average, in the cell membrane. When calcium ions bind to calmodulin, which in turn binds to a Cav1.2 channel, it allows the Cav1.2 channels within a cluster to interact with each other. This results in channels working cooperatively when they open at the same time to allow more calcium ions to enter and then close together to allow the cell to relax. Due to simplicity only two Calcium channels are shown to depict clustering. When depolarization occurs, calcium ions flow through the channel and some bind to Calmodulin. The Calcium/Calmodulin binding to the C-terminal pre-IQ domain of the Cav1.2 channel promotes interaction between channels that are beside each other. Mutation in the CACNA1C gene, the single-nucleotide polymorphism located in the third intron of the Cav1.2 gene, are associated with a variant of Long QT syndrome called Timothy's syndrome and also with Brugada syndrome. A large-scale genetic analysis conducted in 2008 shows the possibility that CACNA1C is associated with bipolar disorder  and subsequently also with schizophrenia. Also, CACNA1C A risk allele has been associated to a disruption in brain connectivity in patients with bipolar disorder, while not or only to a minor degree, in their unaffected relatives or healthy controls. 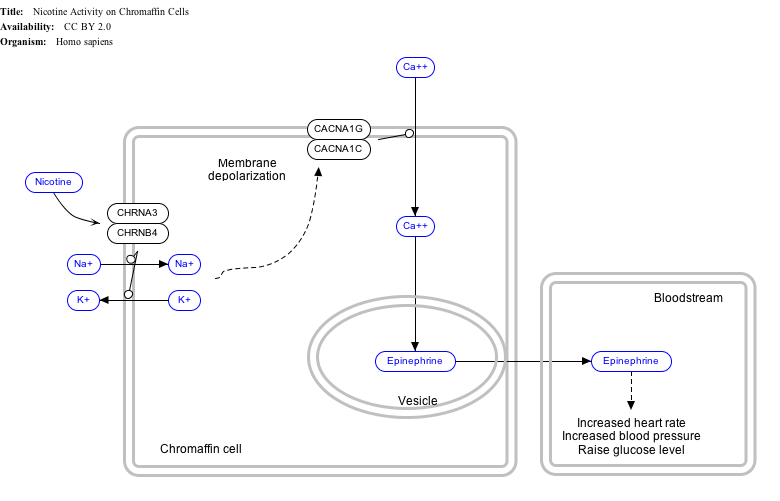 ↑ The interactive pathway map can be edited at WikiPathways: "NicotineActivityonChromaffinCells_WP1603". ↑ "Diseases that are genetically associated with CACNA1C view/edit references on wikidata". ↑ "Drugs that physically interact with Voltage-dependent L-type calcium channel subunit alpha-1C view/edit references on wikidata". ↑ Lacerda AE, Kim HS, Ruth P, Perez-Reyes E, Flockerzi V, Hofmann F, Birnbaumer L, Brown AM (Aug 1991). "Normalization of current kinetics by interaction between the alpha 1 and beta subunits of the skeletal muscle dihydropyridine-sensitive Ca2+ channel". Nature. 352 (6335): 527–30. doi:10.1038/352527a0. PMID 1650913. ↑ Catterall WA, Perez-Reyes E, Snutch TP, Striessnig J (Dec 2005). "International Union of Pharmacology. XLVIII. Nomenclature and structure-function relationships of voltage-gated calcium channels". Pharmacological Reviews. 57 (4): 411–25. doi:10.1124/pr.57.4.5. PMID 16382099. ↑ Shaw RM, Colecraft HM (May 2013). "L-type calcium channel targeting and local signalling in cardiac myocytes". Cardiovascular Research. 98 (2): 177–86. doi:10.1093/cvr/cvt021. PMC 3633156 . PMID 23417040. 1 2 Lipscombe D, Helton TD, Xu W (Nov 2004). "L-type calcium channels: the low down". Journal of Neurophysiology. 92 (5): 2633–41. doi:10.1152/jn.00486.2004. PMID 15486420. ↑ Christel C, Lee A (Aug 2012). "Ca2+-dependent modulation of voltage-gated Ca2+ channels". Biochimica et Biophysica Acta. 1820 (8): 1243–52. doi:10.1016/j.bbagen.2011.12.012. PMC 3345169 . PMID 22223119. ↑ Berger SM, Bartsch D (Aug 2014). "The role of L-type voltage-gated calcium channels Cav1.2 and Cav1.3 in normal and pathological brain function". Cell and Tissue Research. 357 (2): 463–76. doi:10.1007/s00441-014-1936-3. PMID 24996399. ↑ "Entrez Gene: , voltage-dependent, L type, alpha 1C subunit". ↑ Narayanan D, Xi Q, Pfeffer LM, Jaggar JH (Sep 2010). "Mitochondria control functional CaV1.2 expression in smooth muscle cells of cerebral arteries". Circulation Research. 107 (5): 631–41. doi:10.1161/CIRCRESAHA.110.224345. PMC 3050675 . PMID 20616314. ↑ Bergh JJ, Xu Y, Farach-Carson MC (Jan 2004). "Osteoprotegerin expression and secretion are regulated by calcium influx through the L-type voltage-sensitive calcium channel". Endocrinology. 145 (1): 426–36. doi:10.1210/en.2003-0319. PMID 14525906. ↑ Cahalan MD (Oct 2010). "Cell biology. How to STIMulate calcium channels". Science. 330 (6000): 43–4. doi:10.1126/science.1196348. PMID 20929798. ↑ Isaev D, Solt K, Gurtovaya O, Reeves JP, Shirokov R (May 2004). "Modulation of the voltage sensor of L-type Ca2+ channels by intracellular Ca2+". The Journal of General Physiology. 123 (5): 555–71. doi:10.1085/jgp.200308876. PMC 2234499 . PMID 15111645. ↑ Kim EY, Rumpf CH, Van Petegem F, Arant RJ, Findeisen F, Cooley ES, Isacoff EY, Minor DL (Dec 2010). "Multiple C-terminal tail Ca(2+)/CaMs regulate Ca(V)1.2 function but do not mediate channel dimerization". The EMBO Journal. 29 (23): 3924–38. doi:10.1038/emboj.2010.260. PMC 3020648 . PMID 20953164. ↑ Imbrici P, Camerino DC, Tricarico D (2013-05-07). "Major channels involved in neuropsychiatric disorders and therapeutic perspectives". Frontiers in Genetics. 4: 76. doi:10.3389/fgene.2013.00076. PMC 3646240 . PMID 23675382. ↑ Pagon RA, Bird TC, Dolan CR, Stephens K, Splawski I, Timothy KW, Priori SG, Napolitano C, Bloise R (1993). "Timothy Syndrome". PMID 20301577. ↑ Hedley PL, Jørgensen P, Schlamowitz S, Moolman-Smook J, Kanters JK, Corfield VA, Christiansen M (Sep 2009). "The genetic basis of Brugada syndrome: a mutation update". Human Mutation. 30 (9): 1256–66. doi:10.1002/humu.21066. PMID 19606473. ↑ Ferreira MA, O'Donovan MC, Meng YA, Jones IR, Ruderfer DM, Jones L, et al. (Sep 2008). "Collaborative genome-wide association analysis supports a role for ANK3 and CACNA1C in bipolar disorder". Nature Genetics. 40 (9): 1056–8. doi:10.1038/ng.209. PMC 2703780 . PMID 18711365. Lay summary – Schizophrenia Research Forum. ↑ Green EK, Grozeva D, Jones I, Jones L, Kirov G, Caesar S, Gordon-Smith K, Fraser C, Forty L, Russell E, Hamshere ML, Moskvina V, Nikolov I, Farmer A, McGuffin P, Holmans PA, Owen MJ, O'Donovan MC, Craddock N (Oct 2010). "The bipolar disorder risk allele at CACNA1C also confers risk of recurrent major depression and of schizophrenia". Molecular Psychiatry. 15 (10): 1016–22. doi:10.1038/mp.2009.49. PMC 3011210 . PMID 19621016. ↑ Curtis D, Vine AE, McQuillin A, Bass NJ, Pereira A, Kandaswamy R, Lawrence J, Anjorin A, Choudhury K, Datta SR, Puri V, Krasucki R, Pimm J, Thirumalai S, Quested D, Gurling HM (Feb 2011). "Case-case genome-wide association analysis shows markers differentially associated with schizophrenia and bipolar disorder and implicates calcium channel genes". Psychiatric Genetics. 21 (1): 1–4. doi:10.1097/YPG.0b013e3283413382. PMC 3024533 . PMID 21057379. ↑ Radua J, Surguladze SA, Marshall N, Walshe M, Bramon E, Collier DA, Prata DP, Murray RM, McDonald C (May 2013). "The impact of CACNA1C allelic variation on effective connectivity during emotional processing in bipolar disorder". Molecular Psychiatry. 18 (5): 526–7. doi:10.1038/mp.2012.61. PMID 22614292. Kempton MJ, Ruberto G, Vassos E, Tatarelli R, Girardi P, Collier D, Frangou S (Dec 2009). "Effects of the CACNA1C risk allele for bipolar disorder on cerebral gray matter volume in healthy individuals". The American Journal of Psychiatry. 166 (12): 1413–4. doi:10.1176/appi.ajp.2009.09050680. PMID 19952088. Soldatov NM (May 1992). "Molecular diversity of L-type Ca2+ channel transcripts in human fibroblasts". Proceedings of the National Academy of Sciences of the United States of America. 89 (10): 4628–32. doi:10.1073/pnas.89.10.4628. PMC 49136 . PMID 1316612. Powers PA, Gregg RG, Hogan K (Sep 1992). "Linkage mapping of the human gene for the alpha 1 subunit of the cardiac DHP-sensitive Ca2+ channel (CACNL1A1) to chromosome 12p13.2-pter using a dinucleotide repeat". Genomics. 14 (1): 206–7. doi:10.1016/S0888-7543(05)80312-X. PMID 1330882. Sun W, McPherson JD, Hoang DQ, Wasmuth JJ, Evans GA, Montal M (Dec 1992). "Mapping of a human brain voltage-gated calcium channel to human chromosome 12p13-pter". Genomics. 14 (4): 1092–4. doi:10.1016/S0888-7543(05)80135-1. PMID 1335957. Powers PA, Gregg RG, Lalley PA, Liao M, Hogan K (Jul 1991). "Assignment of the human gene for the alpha 1 subunit of the cardiac DHP-sensitive Ca2+ channel (CCHL1A1) to chromosome 12p12-pter". Genomics. 10 (3): 835–9. doi:10.1016/0888-7543(91)90471-P. PMID 1653763. Perez-Reyes E, Wei XY, Castellano A, Birnbaumer L (Nov 1990). "Molecular diversity of L-type calcium channels. Evidence for alternative splicing of the transcripts of three non-allelic genes". The Journal of Biological Chemistry. 265 (33): 20430–6. PMID 2173707. Soldatov NM, Bouron A, Reuter H (May 1995). "Different voltage-dependent inhibition by dihydropyridines of human Ca2+ channel splice variants". The Journal of Biological Chemistry. 270 (18): 10540–3. doi:10.1074/jbc.270.18.10540. PMID 7737988. Soldatov NM (Jul 1994). "Genomic structure of human L-type Ca2+ channel". Genomics. 22 (1): 77–87. doi:10.1006/geno.1994.1347. PMID 7959794. Tang S, Mikala G, Bahinski A, Yatani A, Varadi G, Schwartz A (Jun 1993). "Molecular localization of ion selectivity sites within the pore of a human L-type cardiac calcium channel". The Journal of Biological Chemistry. 268 (18): 13026–9. PMID 8099908. Schultz D, Mikala G, Yatani A, Engle DB, Iles DE, Segers B, Sinke RJ, Weghuis DO, Klöckner U, Wakamori M (Jul 1993). "Cloning, chromosomal localization, and functional expression of the alpha 1 subunit of the L-type voltage-dependent calcium channel from normal human heart". Proceedings of the National Academy of Sciences of the United States of America. 90 (13): 6228–32. doi:10.1073/pnas.90.13.6228. PMC 46901 . PMID 8392192. Perets T, Blumenstein Y, Shistik E, Lotan I, Dascal N (Apr 1996). "A potential site of functional modulation by protein kinase A in the cardiac Ca2+ channel alpha 1C subunit". FEBS Letters. 384 (2): 189–92. doi:10.1016/0014-5793(96)00303-1. PMID 8612821. Soldatov NM, Zühlke RD, Bouron A, Reuter H (Feb 1997). "Molecular structures involved in L-type calcium channel inactivation. Role of the carboxyl-terminal region encoded by exons 40-42 in alpha1C subunit in the kinetics and Ca2+ dependence of inactivation". The Journal of Biological Chemistry. 272 (6): 3560–6. doi:10.1074/jbc.272.6.3560. PMID 9013606. Klöckner U, Mikala G, Eisfeld J, Iles DE, Strobeck M, Mershon JL, Schwartz A, Varadi G (Mar 1997). "Properties of three COOH-terminal splice variants of a human cardiac L-type Ca2+-channel alpha1-subunit". The American Journal of Physiology. 272 (3 Pt 2): H1372–81. PMID 9087614. Gao T, Yatani A, Dell'Acqua ML, Sako H, Green SA, Dascal N, Scott JD, Hosey MM (Jul 1997). "cAMP-dependent regulation of cardiac L-type Ca2+ channels requires membrane targeting of PKA and phosphorylation of channel subunits". Neuron. 19 (1): 185–96. doi:10.1016/S0896-6273(00)80358-X. PMID 9247274. Zühlke RD, Bouron A, Soldatov NM, Reuter H (May 1998). "Ca2+ channel sensitivity towards the blocker isradipine is affected by alternative splicing of the human alpha1C subunit gene". FEBS Letters. 427 (2): 220–4. doi:10.1016/S0014-5793(98)00425-6. PMID 9607315. Meyers MB, Puri TS, Chien AJ, Gao T, Hsu PH, Hosey MM, Fishman GI (Jul 1998). "Sorcin associates with the pore-forming subunit of voltage-dependent L-type Ca2+ channels". The Journal of Biological Chemistry. 273 (30): 18930–5. doi:10.1074/jbc.273.30.18930. PMID 9668070. Liu WS, Soldatov NM, Gustavsson I, Chowdhary BP (1999). "Fiber-FISH analysis of the 3'-terminal region of the human L-type Ca2+ channel alpha 1C subunit gene". Hereditas. 129 (2): 169–75. doi:10.1111/j.1601-5223.1998.00169.x. PMID 10022083.